Skiing and snowboarding is a popular winter sport and activity in British Columbia. Snow may never fall in Metro Vancouver, but there are lots of great ski mountains very close. You can often see the lights of the local ski mountains if you look to the north. These mountains are Cypress Mountain, Grouse Mountain, and Mount Seymour. These famous ski hills attract the locals and tourists throughout winter months. Head to any of these North Shore Mountains to get a full day skiing without all the travel. Only 2 hours north of Vancouver is Whistler Blackcomb. This world-renowned ski resort has two amazing mountains and a beautiful European style ski-in, ski-out village. Did you know? Vancouver and Whistler hosted the 2010 Winter Olympic Games. Vancouver’s most-visited year-round attraction is Grouse Mountain. Located 15 minutes from downtown, you can enjoy beautiful views above the city skyline. Take a bus and go on a skiing and snowboarding day trip. Or go up the mountain after dark and try out some night skiing below the lights. There are lots of other fun things to do at Grouse Mountain too. Try skating on the outdoor pond, snowshoeing, and much more. Only a 30-minute drive from downtown Vancouver, Mt Seymour is a relaxed West Coast ski hill. Mt Seymour is an excellent place to learn how to ski or snowboard and try out the terrain park. Many passionate skiers and snowboarders have skied here for years and love to share their excitement for the skill hill. Did you know? Mt Seymour is Vancouver’s only family owned and operated ski area! 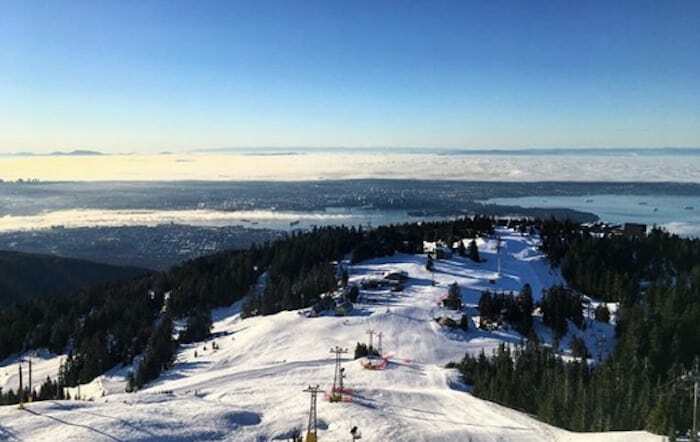 Cypress Mountain offers skiers with the most vertical drop, most terrain, and most lifts of Vancouver’s North Shore Mountains. Only 30 minutes from downtown, Cypress has 52 winter skiing runs, cross-country skiing trails, a snow tubing park, and popular snowshoeing tours. Cypress has something for everyone to do! Whistler and Blackcomb is a top-ranked destination ski resort that attracts skiers from around the world. A further trip than the other mountains on the list, Whistler Blackcomb is worth the journey. Enjoy the beautiful drive up the Sea to Sky Corridor into the stunning Coast Mountains.